While the accuracy of link prediction has been improved continuously, the utility of the inferred new links is rarely concerned when it comes to information diffusion. This paper defines the utility of links based on average shortest distance and more importantly defines a special type of links named bridge links based on community structure (overlapping or not) of the network. In sociology, bridge links are considered to play a more crucial role in information diffusion across communities. 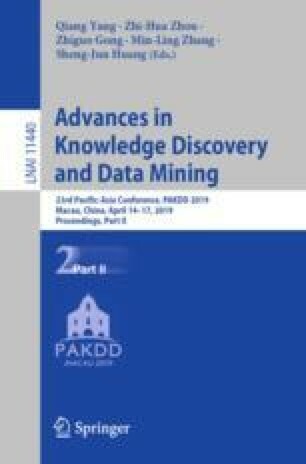 Considering that the accuracy of previous link prediction methods are high in predicting strong ties but not much high in predicting weak ties, we propose a new link prediction method named iBridge, which aims to infer new diffusion paths using biased structural metrics in a supervised learning framework. The experimental results in 3 real online social networks show that iBridge outperforms the traditional supervised link prediction method especially in inferring the bridge links and meantime, the overall performance of predicting bridge links and non-bridge links is not compromised, thus verifying its robustness in inferring new links. This research was supported by the National Nature Science Foundation of China (No. 61571238, No. 61603197 and No. 61772284).